When you mention “Amish”, most people don’t think of the South. Yet for over 60 years, a flourishing Amish settlement has existed just an hour-and-a-half outside of Nashville. The Amish settlement at Ethridge, Tennessee is home to a population of roughly 1,500 Amish. This community was founded in 1944 by Amish from an extinct settlement at Lumberton, Mississippi, as well as Amish from Wayne County in Ohio. The Amish in this settlement are very conservative, belonging to a Swartzentruber affiliation. The Swartzentruber Amish are among the most conservative in Amish society. Like other Swartzentruber Amish, the Amish at Ethridge do not use the Slow-Moving Vehicle triangle, meaning extra caution is required while on the road. Homes are extremely plain, as is the clothing worn by individuals in this settlement. Dairy and produce farming are common ways of making a living for Amish in the Ethridge settlement. 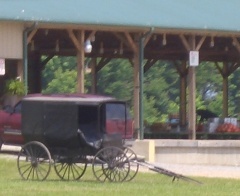 Amish run numerous businesses in the area too, often selling products direct from home. 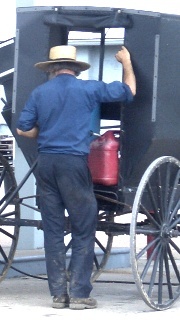 Low levels of technology are used in general, restricting the businesses Ethridge Amish operate. Despite technological limitations, Ethridge Amish run at least 50 businesses in this corner of Tennessee. Amish businesses include furniture makers, produce growers, candle makers, clock repair, and rugs. An important part of the local economy is the produce auction which takes place 3 times a week in the growing season (April-October). Local Amish produce growers bring their goods for sale. Among others, Amish sell peppers, tomatoes, corn, cantaloupes, strawberries, and many other vegetables and fruits. Produce auctions have become an increasingly popular way for Amish to make a living. Produce requires less capital and land than traditional dairy farming. Additionally, public interest in “all-natural” and organic products help drive this market. 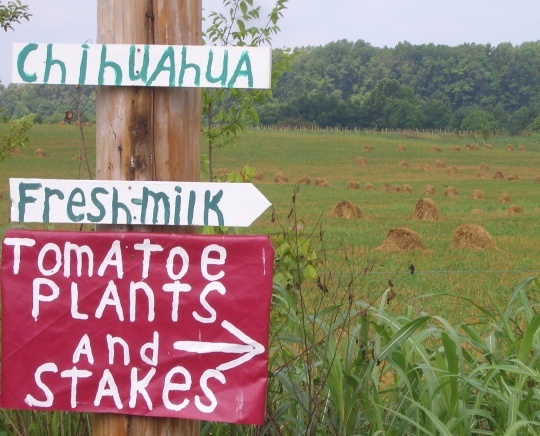 Amish may run a produce business on the side, or even make a full-time living at it. As one of the oldest and largest Amish settlements in the South, Ethridge features a fairly well-developed tourist industry. An “Amish Welcome Center” provides visitors with a map of the area, with Amish businesses and the products they sell clearly marked. Numerous outlets sell Amish furniture, books, and other Amish memorabilia (read more on Amish furniture in Tennessee). Restaurants, stores, and a number of wagon-ride operations provide visitors with opportunities to experience Amish culture. Amish indirectly participate in the tourist industry as well. Some Amish sell products directly from locations at the English-run tourist-themed businesses. Others receive tour visitors who buy their products direct from home or from an adjacent shop on the property. In addition to the community at Ethridge TN, Amish have also settled in other parts of Tennessee. 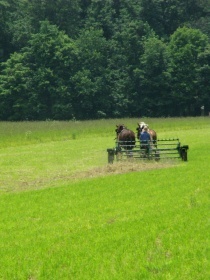 Small Amish settlements can be found at five locations in Tennessee, including at Huntington and Bruceton in Carroll County (founded 1975), McKenzie (1998), and Summertown (2000). As of 2010, all of these settlements are comprised of no more than one or two church districts. In addition to the present-day communities, Tennessee has a history of settlements that failed as well. Before the landmark Supreme Court decision of Wisconsin vs. Yoder granted Amish the right to remove their children from school after grade 8, Amish often came into conflict with state authorities over the issue of schooling. Frequently, Amish would move to states where authorities were more accommodating. Such was the case with the community that once existed at Hohenwald, in Lewis County. The Hohenwald settlement was founded by Amish from the Swiss Amish settlement at Adams County in Indiana (Swiss Amish are a different ethnic group within Amish society). Amish from this community chose land in Lewis County, near to the young settlement at Ethridge, which had also recently been established by Amish motivated for reasons of schooling. Amish began moving to Hohenwald in 1947, but the settlement failed to attract many settlers, and never grew larger than eleven families. However, at least one interesting story emerged from this little-known TN settlement, when one Amish immigrant, Rudy Wickey, chose a particularly unusual means of making the 550-mile trip to Tennessee. Rudy Wickey was an Amishman living in Wayne County, Ohio. Wickey decided to make the trek to join the settlers in Tennessee by covered wagon pulled by two work horses and a pony. Accompanying him were his wife and five children. Wickey left for Tennessee in late 1947. “Little did they realize,” writes Amish historian David Luthy, “that their pictures would be in newspapers across America” (Settlements that Failed, Luthy, p450). 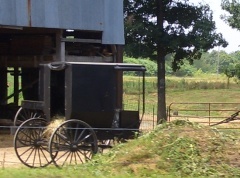 Wickey was stopped by authorities before leaving Holmes County, due to the overloaded condition of the Amishman’s wagon. Wickey’s wife and children continued on to Tennessee by train, but the Amishman was determined to make the journey by covered wagon. Luthy reports that Wickey’s picture was taken by newspaper photographers, and that “The Associated Press wire service picked up his story and announced to all America when he had reached his destination, quoting Wickey as having said that he was “happy to be in Tennessee where the people are more lenient toward those of our faith” (Settlements that Failed, Luthy, p 451). Amish in this corner of Tennessee made a living by raising a variety of crops, including strawberries and tomatoes, and also cut and sold lumber. Eventually, church ministry moved away from the community. The last families at the Hohenwald TN settlement relocated in 1955. A settlement of Amish once existed in the Volunteer State at Dickson County. This settlement was founded by Amish from Daviess County, Indiana, who settled here in 1890. David Luthy reports that Amish settlers to the area encountered “rough locals”, with an affinity for moonshine and fighting. One such fight resulted in a gun and knife battle which left two dead. Shortly thereafter, some people attempted to set the county seat of Dickson ablaze, destroying 28 buildings. Other challenges included the climate, which alternated from very wet to very dry. Farming was difficult as a result. Farmers raised corn, oats, wheat and hay, and also fruit. One family operated a sawmill. Eventually, the challenges of farming, combined with the Panic of 1893 financial depression caused the Dickson County settlers to migrate to more favorable Amish communities, with the last family likely leaving in 1899. Amish are currently found in a total of four settlements in the Volunteer State. Ethridge is by far the largest and best-known. Ethridge has also spawned daughter settlements in both Tennessee and Kentucky. The total population of Amish in Tennessee is approximately 2,100 as of 2010, spread over 6 settlements and 17 church districts. The Amish of Tennessee have appeared on the Amish America blog a number of times. The Ethridge Amish community was featured in a post from summer 2010, as was the Ethridge produce auction. 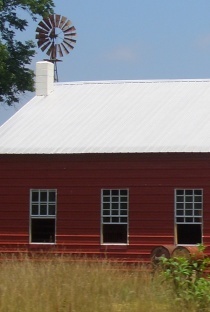 The ‘Para-Amish’ church at Lobelville, Tennessee was mentioned in a post on Amish diversity. Tennessee Amish were discussed in a much-commented post on Amish communities in the South. Karen Johnson-Weiner discussed Tennessee Amish communities in the context of the Swartzentruber Amish church divisions. Here you can also see all posts tagged “Tennessee Amish“. I am looking to buy the Amish Rockers made that are made from the tree limb look. If someone could email me at the above email and tell me where the closest store would be to Kingsport, TN. I would greatly appreciate it. Susan I don’t know of any over yer way but Wayne Yoder here Huntingdon, TN makes some very nice ones like you describe. I was just at his house last night and saw a truck with a trailer load of “porch swings” pull out as we pulled in. And he was building one as we walked in the garage. He had several chairs and a “glider” sitting there finished. I didn’t pay attention if any were rockers or not, but I know he makes them. But here lately I think he has been building more “gliders” per requests than the rockers. I could always ask for you and get back to you. I’m pretty sure the # listed below by Bev is his #. But I’m not positive since I never call him I just stop in or see him out an about the community. I too am looking for an Amish pen pal. I would absolutely love it! If anyone has any info on that please let me know. The produce auction is up and running..with auction every Monday, Wednesday and Friday starting at 1 p.m. The Annual Consignment Auction this year will be on Oct 11 starting at 9 a.m. There will be animals again this year..and there will be NO BUYERS premium…Please spread the word! I have a home in Beechview (near Clifton, TN) that I would like to be selectively cleared of 60-80 trees. I would like to exchange the cut trees in exchange for labor. I am looking for Andy Bowyer in Lobelville TN. I had a phone number but it has been disconnet. He was refer to me by someone else here in McEwen. Looking for someone to do roofs. If you raise and sell Roma Beans, I would very much like to buy about 3 bushels. This is my families favorite. We have always had a garden, but due to declining health, we are no longer able. Please contact me. I’ve heard of a horse trainer in summertown amish community.would like to discuss about training a horse for a child. I have no idea where this community is, but iv’e heard they are the best..can anyone help me on directions? We had a barn that we were told was Amish built. We would love to have the same barn built again on our new property when we move, and are wondering the how to find/contact Amish builders in Middle Tennessee to discuss the barn and riding arena and get a quote for construction. We are in the Nashville area (Wilson County). I am a woodworker that just relocated to TN. I am looking for a source for chairs that would we can offer with our farm tables. Thanks in advance to anyone who can point me in the right direction…. Kevin one of our readers emailed me “Check out the Athens and Delano,Tennessee Amish.” I don’t know so much about those communities, but may be worth a look. 731.986.4434 is a good number to call. The man checks the numbers that are on the caller ID and returns them around noon central time. He makes what we refer to as Amish rockers (they call them hickory rockers) as well as foot stools, tables, double swings. I’ve bought some of all of them and love them. I am in need of a master carpenter to make me a head board for a bed. does anyone know of a good shop that will work outside of the community. Would you happen to know who the Amish Bishop is for the community of Huntingdon, TN & his address? Also what is the date in April for the Amish auction in Huntingdon, TN.? I noticed that the Stantonville Amish weren’t mentioned. Do you know anything about them? I have a friend who buys milk from them but haven’t met any myself, just see them at the Selmer Walmart. I was told about four brothers who build quality homes and make furniture in Summertown, TN or Ethridge, TN who work with Quality Metal in Summertown, TN. Me and my husband are wanting to build a home and barn on our land. We are looking for a number to contact this group of builders. I heard they have built a lot of quality homes along the Tennessee River, can you please provide me with a number? I don’t know about the ones in Summertown, but I do know of some Brothers that are contractors in Huntingdon, TN as well as their father who is a contractor and their cousin as well between them they run 4 crews that work locally and away as well! One crew I know of does a lot of work in the Franklin, TN area and another one does a lot in the McEwen/Waverly area. How can I get in to get in contact with the community in Etheridge? I’d like the fastest way to get in touch with them and get a reply as soon as possible. Thank you! Well not knowing anyone in that community directly I’d have to say the fastest way to contact them is to jump in your car and drive out there. Now if you were looking to contact someone in either the Huntingdon, or McKenzie settlements I probably know them and could easily get you in touch with them. I work at Waverly Wood in Waverly, TN. We are looking to hire Amish workers in laborer positions. We will provide transportation to and from work if it is within a reasonable mile radius. You can contact me at 931-296-1455 if you know anyone that is interested in working Monday – Friday starting at $9.50 per hour. Lisa I hate to be the bearer of bad news but if they are Amish they won’t be reading this on a computer as the Amish shun technology. Check out Erik’s posts on the Amish and computers. There are Amish people in some communities & groups who DO use a computer at work, some who might use it at a public library. I’m Amish and use a computer at my job. There have been Amish people who have posted on here as “feature” articles as well as comments. We are looking to speak with builders from the Amish community near Springfield or Pleasant View who might be interested in building a home for us on land that we own. My daughter had a deck installed by an Amish family in Kentucky and they did an awesome job. My husband and I looking to replace our 1,000sqft deck. We are in Dandridge, TN. Any recommendations in the Amish or Mennonite community that would be interested? Thank you. Looking to purchase rug selvage to weave rag rugs. I was told someone in the Ethridge area sold it.